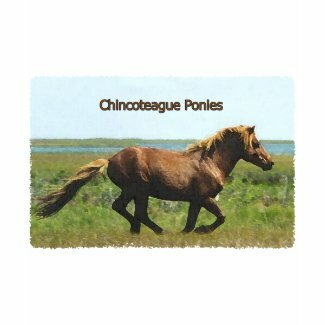 has released a variety of new Chincoteague Island artwork. Logos are available on t-shirts, tank tops, sweatshirts, hoodies, stickers, buttons, postcards, notecards, coffee mugs, and other products. Among the new designs are wild Chincoteague pony illustrations, Chincoteague Island aquatic bird logos, Assateague Island lighthouse art and other work.